Update: Download the plugin on Github. It’s a pretty common scenario when working with a Solr-powered search engine: you have a list of synonyms, and you want user queries to match documents with synonymous terms. Sounds easy, right? Why shouldn’t queries for “dog” also match documents containing “hound” and “pooch”? Or even “Rover” and “canis familiaris”? A Rover by any other name would taste just as sweet. As it turns out, though, Solr doesn’t make synonym expansion as easy as you might like. And there are lots of good ways to shoot yourself in the foot. Solr provides a cool-sounding SynonymFilterFactory, which can be a fed a simple text file containing comma-separated synonyms. You can even choose whether to expand your synonyms reciprocally or to specify a particular directionality. For instance, you can make “dog,” “hound,” and “pooch” all expand to “dog | hound | pooch,” or you can specify that “dog” maps to “hound” but not vice-versa, or you can make them all collapse to “dog.” This part of the synonym handling is very flexible and works quite well. Where it gets complicated is when you have to decide where to fit the SynonymFilterFactory: into the query analyzer or the index analyzer? 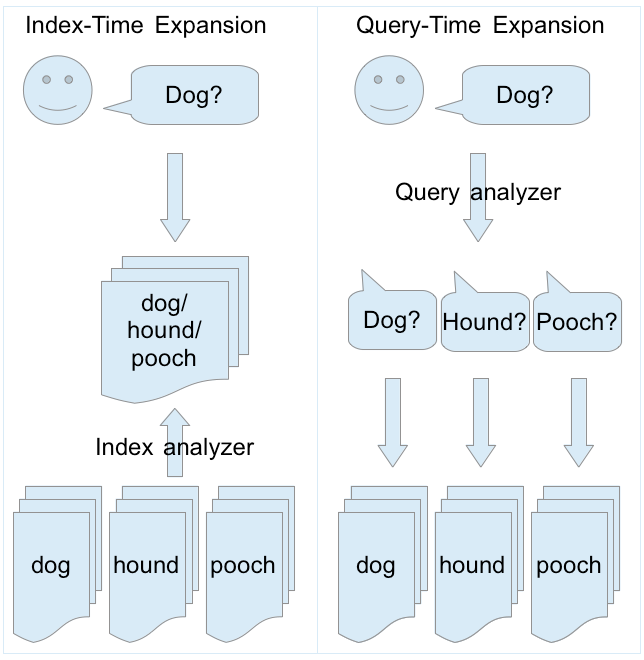 The graphic below summarizes the basic differences between index-time and query-time expansion. Our problem is specific to Solr, but the choice between these two approaches can apply to any information retrieval system. Your index stays the same size. Your synonyms can be swapped out at any time, without having to update the index. Synonyms work instantly; there’s no need to re-index. Multi-word synonyms won’t work as phrase queries. The IDF of rare synonyms will be boosted, causing unintuitive results. Multi-word synonyms won’t be matched in queries. This is kind of complicated, so it’s worth stepping through each of these problems in turn. …which matches documents containing “breast neoplasms,” “cancer of the breast,” etc. However, this also means that, if you’re doing a phrase query (i.e. “breast cancer” with the quotes), your document must literally match something like “breast cancer breast breast” in order to work. The spaghetti you actually get. And your poor, unlikely document must match all four terms in sequence. Yikes. Index-time expansion supposedly fixes this problem by giving the same IDF values for “dog,” “hound,” and “pooch,” regardless of what the document originally said. Finally, and most seriously, the SynonymFilterFactory will simply not match multi-word synonyms in user queries if you do any kind of tokenization. This is because the tokenizer breaks up the input before the SynonymFilterFactory can transform it. Edit: I’ve been corrected on this. Apparently, the bug is in the Lucene query parser (LUCENE-2605) rather than the SynonymFilterFactory. I initially followed Solr’s suggestions, but I found that index-time synonym expansion created its own issues. Obviously there’s the problem of ballooning index sizes, but besides that, I also discovering an interesting bug in the highlighting system. After reading through this Solr bug, I discovered it’s because of the same issue above concerning how Solr expands multi-word synonyms. This is literally what Lucene thinks your document looks like. Synonym expansion has bought you more than you bargained for, with some Dada-esque results! “Breast tumor the options” indeed. Essentially, Lucene now believes that a query for “cancer of the breast” (4 tokens) is the same as “breast cancer treatment options” (4 tokens) in your original document. This is because the tokens are just stacked one on top of the other, losing any information about which term should be followed by which other term. Query-time expansion does not trigger this bug, because Solr is only expanding the query, not the document. So Lucene still thinks “cancer of the breast” in the query only matches “breast cancer” in the document. All of this wackiness led me to the conclusion that Solr’s built-in mechanism for synonym expansion was seriously flawed. I had to figure out a better way to get Solr to do what I wanted. Synonyms don’t work instantly; documents must be re-indexed. Synonyms cannot be instantly replaced. Multi-word synonyms cause arbitrary words to be highlighted. Phrase queries do not work. IDF values for rare synonyms are artificially boosted. I began with the assumption that the ideal synonym-expansion system should be query-based, due to the inherent downsides of index-based expansion listed above. I also realized there’s a more fundamental problem with how Solr has implemented synonym expansion that should be addressed first. Going back to the “dog”/”hound”/”pooch” example, there’s a big issue usability-wise with treating all three terms as equivalent. A “dog” is not exactly the same thing as a “pooch” or a “hound,” and certain queries might really be looking for that exact term (e.g. “The Hound of the Baskervilles,” “The Itchy & Scratchy & Poochy Show”). Treating all three as equivalent feels wrong. Also, even with the recommended approach of index-time expansion, IDF weights are thrown out of whack. Every document that contains “dog” now also contains “pooch”, which means we have permanently lost information about the true IDF value for “pooch”. In an ideal system, a search for “dog” should include documents containing “hound” and “pooch,” but it should still prefer documents containing the actual query term, which is “dog.” Similarly, searches for “hound” should prefer “hound,” and searches for “pooch” should prefer “pooch.” (I hope I’m not saying anything controversial here.) All three should match the same document set, but deliver the results in a different order. My solution was to move the synonym expansion from the analyzer’s tokenizer chain to the query parser. 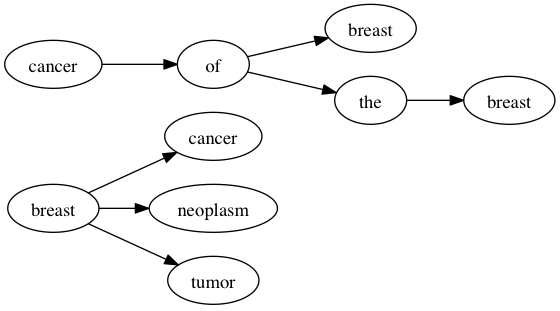 So instead of expanding queries into the crazy intercrossing graphs shown above, I split it into two parts: the main query and the synonym query. Then I combine the two with separate, configurable weights, specify each one as “should occur,” and then wrap them both in a “must occur” boolean query. The 1.2 and the 1.1 are the independent boosts, which can be configured as input parameters. The document must contain one of “dog”, “hound,” or “pooch”, but “dog” is preferred. The code I wrote is a simple extension of the ExtendedDisMaxQueryParserPlugin, called the SynonymExpandingExtendedDisMaxQueryParserPlugin (long enough name?). I’ve only tested it to work with Solr 3.5.0, but it ought to work with any version that has EDisMax. Edit: the instructions below are deprecated. Please follow the “Getting Started” guide on the Github page instead. Drop this jar into your Solr’s lib/ directory. The analyzer you see defined above is the one used to split the query into all possible alternative synonyms. Synonyms that are exactly the same as the original query will be ignored, so feel free to use expand=true if you like. This particular configuration (StandardTokenizerFactory + ShingleFilterFactory + SynonymFilterFactory) is just the one that I found worked the best for me. Feel free to try a different configuration, but something really fancy might break the code, so I don’t recommend going too far. For instance, you can configure the ShingleFilterFactory to output shingles (i.e. word N-grams) of any size you want, but I chose shingles of size 1-4 because my synonyms typically aren’t longer than 4 words. If you don’t have any multi-word synonyms, you can get rid of the ShingleFilterFactory entirely. Add defType=synonym_edismax to your query URL parameters, or set it as the default in solrconfig.xml. synonyms boolean false Enable or disable synonym expansion entirely. Enabled if true. synonyms.analyzer String null Name of the analyzer defined in solrconfig.xml to use. (E.g. in the example above, it’s myCoolAnalyzer). This must be non-null, if you define more than one analyzer. synonyms.originalBoost float 1.0 Boost value applied to the original (non-synonym) part of the query. synonyms.synonymBoost float 1.0 Boost value applied to the synonym part of the query. synonyms.disablePhraseQueries boolean false Enable or disable synonym expansion when the user input contains a phrase query (i.e. a quoted query). Note that the parser does not currently expand synonyms if the user input contains complex query operators (i.e. AND, OR, +, and –). This is a TODO for a future release. I also plan on getting in contact with the Solr/Lucene folks to see if they would be interested in including my changes in an upcoming version of Solr. So hopefully patching won’t be necessary in the future. In general, I think my approach to synonyms is more principled and less error-prone than the built-in solution. If nothing else, though, I hope I’ve demonstrated that making synonyms work in Solr isn’t as cut-and-dried as one might think. As usual, you can fork this code on GitHub! 97 responses to this post. Thank you very much for your nice work ! This message is the same on a solr server 3.5.0 and 3.6.1. Do you have any idea about the problem? Could you provide some more info about your situation? Full stacktrace, servlet container you’re running (e.g. Tomcat, Jetty), your Java version, etc. I found this page, which says it may be a problem with Tomcat 7. Let me know if modifying your web.xml fixed the problem for you. For the record, I used Java 6, Tomcat 6, and Solr 3.5.0. 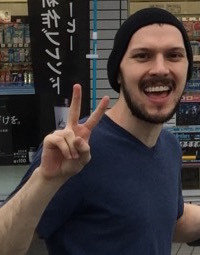 I think I’ve found the culprit. It looks like in Solr 3.5.0, ExtendedDismaxQParserPlugin defines “queryFields” to be package-private, whereas in Solr 3.6.1, it becomes private. So my code fails because I try to access the superclass’s “queryFields” (here). I’ve filed this as a bug on the GitHub page, and I’ll try to address it as soon as I can. Unfortunately this seems like a pretty nasty problem, and I don’t know if there’s any way I can make it work without gutting the offending lines of code. But I’ll look into it. I also think the problem is at this private access to the field “queryFields”. I hope you can find a solution (My java skills stops here, sorry). Thank you very much for your promptness ! I was just about to start experimenting with this when I found your blog via Google (small world? well maybe not that many people are playing with Solr and MeSH after all). Very helpful post! Thanks much for the nice work. We also were not happy with the solr synonym handling and were thinking along the lines of writing a query parser and glad that we found this post. We are using solr 4.0. I got the source code for the SynonymExpandingExtendedDismaxQParserPlugin from github and fixed few package imports (from solr to lucene — modeled after ExtendedDismaxQParserPlugin) and fixed couple of issues because of the new ResourceLoaderAware class, but hit into the private queryFields error. Would appreciate if you have any update on this issue. I actually was able to fix the queryFields problem, but I just hadn’t merged my changes into the master branch yet, because during my testing of Solr 3.6.1 I ran into a (probably) unrelated issue. It’s committed to the master branch now. If you have other changes for Solr 4.0, though, then please merge your code with mine (up to the latest commit), test it, and if it works in Solr 4.0, then please send me a pull request in GitHub. Hopefully we can make this work for Solr 3.5, 3.6, 3.6.1, and 4.0 in one fell swoop! I did contact the Lucene/Solr folks. It remains to be seen if they will integrate my changes, but if not, then I’m also happy to just consider this as a separate plug-in. Thanks. Once we have working version of the code with solr 4.0, will send the code to you. > changes, but if not, then I’m also happy to just consider this as a separate plug-in. Please do file the JIRA issue with your patch and set Fix Version to 4.2. Thanks. By placing the files apache-solr-solrj-3.5.0.jar & apache-solr-core-3.5.0.jar in /example/lib , I was able to get it past the original complaints. Now the compile error is the following. I think this discussion is starting to outgrow WordPress. I’d prefer for us to document this in GitHub, so I created a new GitHub issue to track all the compatibility problems with Solr 3.6.0, 3.6.1, and 4.0. If you need help, I suggest you make a Jira issue in the Solr project like Otis also suggested. You can upload none working patches so others can try to fix them. Good luck. Looking forward to testing this feature. Thanks for the blog post! It’s nice to have a confirmation of the strange behavior I’m getting with edismax, q.op=AND and synonym expansion of multi-word ontology terms. An option I’ve considered is to move the term expansion out of Solr and into the application layer – that way I can carry forward your idea of a reduced boost for synonyms and also reduce the boost score based on how far down the DAG tree a child ontology term is. I’m working with Solr for a model organism database – always nice to find more bio/med search people! I got it to work in run-time, and I want to just compliment you on how stunningly it works. I tested it with 3 word phrases and it broke it into single words, and then to ensure it finds the phrases exactly, I added quotes in the synonyms_extended.txt file. It worked like a charm. I put the code for your synonym parser in with the rest of the actual Solr 3.5 source, and compiled the entire Solr source. Then I took that solr.war file and replaced my old one. The issues that we keep seeing here, has to do with how Jetty, and Tomcat for that matter load the solr.war file, who is the envelope to the jars, and since the war file had no previous knowledge of the synonym parser being an extension of the QParser, well, you see the picture. My next project is how to write it without needing to recompile solr.war, so that it’s just a synonymexpander.jar file I can drop into the lib folder, restart solr and be done and ready to go with the stock solr.war. Yes, this helps a ton. Unfortunately, until we find a solution using a drop-in JAR file, it sounds like your “compile along with Solr” solution is the only reasonable one. Since this is the case, though, and since I’ve gotten so much positive feedback on this code, I will file an issue in the Solr JIRA itself to add my code as a patch. I’m also taking the liberty of adding your comments to the GitHub issue. Please, folks, restrict your comments/bugfixes/me-too’s to GitHub! :) Thanks. All right, compatibility bug fixed, documentation improved, and JIRA issue filed. Let’s see if this code can make it into an upcoming version of Solr. How does Solr handle synonyms when the term is ambiguous? Let’s take “book” which can be both a noun and a verb. Is Solr going to return synonyms of both meanings? Unless Solr fully disambiguates in context, which, to the best of my knowledge, it doesn’t, expanding query terms to synonyms will, in this case return even more irrelevant results than just using the query term. Do you know of an algorithm that deals with slang and words in context like you describe? as an example, Google returns results for Books, when searching for Book. and Booking sites, when you search for “Book It” or Booking. Solr has a well oiled Protected Words factory to deal with cases such as “Book It” and Booking. Enter what you need into the protected words file, ensure the Type of the field is using the Protected words factory, and voilla, Solr won’t stem and dismember the terms, but it has to appear as is in your data for this to work. Then, you can make synonyms between booking, book it, booking it, making a booking etc. Our own semantic platform (Inbenta) handles disambiguation in context and it does it for several languages. Your example of “booking”, “book it”, “booking it” is fine but it is, pardon my French, trivial. In all these instances “book” has only one meaning, the meaning of “reserve”, so there’s no need to disambiguate. What if the Content has documents containing expressions like “ship a book” and “book a ship”? Neither Solr nor Nolan’s open-source improvement deals with synonym semantics, nor do they claim to. Your “constructive criticism” seems no more than advertising. ??? I am sorry but I responded to a post by AB asking for an algorithm doing what I describe. It’s not advertising, it’s answering a question. Oh, I see now. Sorry, Philippe. The indentation didn’t make it clear that your comment was a reply, so I thought you were commenting on the overall blog post. Once again, sorry. Have you been able to do any work on the below statement? I am interested in using the Synonym handler you have created, but I need to add some additional information to the query to get the correct results. I have your code setup and it works as described thanks… just need a little more. Thanks a lot for the great work! Is it safe to use your lib with Solr 4.2? Yep, I just confirmed that the branch I wrote for Solr 4.1 also works fine in Solr 4.2. I.e. the unit tests pass. Could you explain what the effect of back pack=>backpack is? It transforms all instances of “back pack” to “backpack,” but not the opposite direction. This is the very one I want and find for my search system. But I have one question and problem for this. This query parser uses raw query itself twice. For example, I search the query “ny” which has synonyms. And I check the query phrase, I find the “ny” twice on that. The query “new york” is same to that. When I check the score of matched documents, those get advantages. I think, raw query doesn’t need to be searched in the synonym search phrase. Please consider about it. #after us won’t split it into two words. I have one more question about synonym_edismax. Actually we set the field types in schema.xml just like below and when we index/query for each field, just solr can work with those setting. But for synonym_edismax, I can set the only one tokenizer. How shall I do synonym search for each field which has diffrent type(diffrent tokenized)? Great post. Have you read the post from Mike McCandless ‘Lucene’s TokenStreams are actually graphs!’ at http://blog.mikemccandless.com/2012/04/lucenes-tokenstreams-are-actually.html. I think the problem you are having with the highlighting extra terms is a effect of a problem he called sausagization! LOL I have a similar situation to this, we are adding semantic tags that can span terms, and like you and I came to almost the exact same solution, although I didn’t think to play around with the boost. That’s a great idea. Thanks for the link. “Sausagization” perfectly describes the highlighting problem I mentioned above. Since the author says that fixing this problem would require some fairly low-level changes in Lucene’s indexer, it sounds like my solution is still pretty useful for the time being! why isn’t it something like: +(DisjunctionMaxQuery((text:dog))……. I am getting the same kind of result, what was the typo in the request? Not sure, but there are instructions in the readme on running the Python tests. It will build up the config and query automatically. Ah, it could be qf=text. I think I used the name field instead. First of all, thanks for the great job done! Your synonyms expanding parser is very helpful and definitely a big step forward for the synonym handling in Solr. Were you able to make stemming work with your parser? What if you want “dogs” to be expanded without explicitly specifying plural form in the synonyms list? Hi, great job for us, now im trying get the synonyms from a web service that already we have, can you help me to achieve? Because of the way the SynonymFilterFactory is designed, I believe you’d have to download all the synonyms from your web service and save them as a text file (as described in the SynonymFilterFactory documentation). Nice work, thanks. Do you know whether anyone’s tried applying a similar design for a raw Lucene environment/repository (i.e. subclassing QueryParser)? No, although if you wanted to replicate what I did, the code itself would be pretty straightforward. Basically, I just built up a lattice, expanding the query into every possible synonym combination (e.g. dog bites -> dog nibbles, pooch bites, pooch nibbles). Very nice tool, thanks. Is it possible to integrate synonyms in other way rather than save them as a text file as described in the SynonymFilterFactory documentation? For example: if synonyms or other related concepts are in xml files (as thesaurus). If yes, where reading of such synonyms source can be done? Sorry, this plugin is really pretty tightly coupled to the SynonymFilterFactory file format. It’s Jan 2014, Solr 4.6 is out, and in the Wiki, yours is the first mentioned and recognized 3rd party Query parser extension. That’s great! It’s nice to see folks getting so much use out of the plugin. I think this is because the synonym list is too big. Is it possible to use this kind of expanding in index time to avoid this error? Before I deep dive into the code, I wanted to know wether this queryParser would be adaptable for this need. Second of all, what do you think of contributing the code to solr project so you wouldn’t have to worry for maintaining the code? Unfortunately, the synonym plugin wasn’t really designed for hierarchical synonyms or meronyms/holonyms as you describe. You can attach different synonym files to different fields in order to achieve what your want, but it’d be kinda hacky. Can you explain how different synonym files can be attached to different fields using your synonim plugin? Check out the example config. Where it says “myCoolAnalyzer”, you can add multiple tags with whatever analyzers you want, e.g. “myCoolAnalyzer2”, “myCoolAnalyzer3”, etc. Then when you query, you just specify the analyzer you want to use with the synonyms.analyzer option. Unfortunately you’ll have to do a separate query for each analyzer, though. The configuration besides that is pretty simple, the plugin itself works nicely, but it cannot find the one and only “MyCoolAnalyzer” with it’s defined values from solrconfig. It always gives me NoAnalyzerSpecified/AnalyzerNotFound no matter what I do (even got the Java source and set the name to look for statically to “MyCoolAnalyzer”. The Collection just stays empty. I guess it is a pretty dumb mistake, but if anyone could give me a pointer in the right direction I’d appreciate it very much. Sorry, I figured my issue out as well (misallocated synonyms file) – Thank you so much for the great Plugin! Hi Bernd, if you check out the code you will see that there are Python scripts to set up a little Solr server and run the tests automatically. It even downloads the Solr binaries for you, so you don’t have to do anything except have Python and Java installed. If you compare that setup to yours, I’m sure you’ll see what the issue is! Cheers. Thanks for great plugin. I tried your parser. Its expanding the queries as expected but I’m getting zero responses. Also I must mention that I’m just starting with solr and lucene. Sorry, found the culprit. It seems I hadn’t set the parameters of edismax correctly. Hey Nolan, long time no see!!! Guess what… I m currently working on my medical thesis which concerns some kind of search engine in the patients documentation. The thing is supposed to be well suited to in-hosp physicians (whose effectiveness on EHRs is quite poor in general, I must admit… ). I m gonna delve into it right away so thanks for the work! The synonyms project is still going strong, and still the most popular project on the HON’s GitHub page. So yeah, it filled a neat little void in the Solr ecosystem. Take care; hope your thesis goes well! Thanks for your great plugin, this plugin completely satisfies our requirement. I tried your synonym parser with below config and synonyms dictionary but i have issue with expansion of multi-terms/phrase synonyms. I am looking in to your code to find the cause of the issue. let me know where i am wrong, let me know if you need any more info on this issue. Thanks for your great plug-in, this plug-in completely satisfies our requirement. I tried your synonym parser with below config and synonyms dictionary but i have issue with expansion of multi-terms/phrase synonyms. Please ignore/delete this comment, sorry about the wacky comment. Please ignore/delete my previous comment, sorry about the wacky comment. Thanks for your great plug-in, this plug-in completely satisfies our requirement. Please ignore my previous/delete my previous comments. Your plugin is working as expected after i added the “filter” config in the parser. I guess i am not missing any required configs :). Please let me know if you need more info on this issue. Thanx for letting me know that this plugin is no longer supported, can you plz share the alternative to this if you have? Created issue #48 to track this. Shame it is not supported anymore. Really useful plugin. Anyone tested this with Solr5 yet? Is the reason for this plugin to be not supported being that its now integrated into the main solr build as mentioned by you in the Jira https://issues.apache.org/jira/browse/SOLR-4381 ? Doesn’t look like a final solution is integrated anytime soon. Luckily this solution still works with Solr 5.2.1. As Okke said, this seems to work well with Solr 5.2.1. I had a bit of trouble getting Solr to load hon-lucene-synonyms-1.3.5-solr-4.3.0.jar properly, but in the end I put it in a folder under the new folder server/solr/lib and modified my java command which launches start.jar to include the parameter -DsharedLib=/path/to/server/solr/lib , and then everything worked well. Thanks for the work Nolan. Its really interesting approach and I am eager to try it. I am however getting following error when I run it on SOLR 4.10.2, do you know what could be wrong? My apologies for the previous post. I was using wrong version of the jar, and downloaded correct jar for my solo version (4.10.2) from https://github.com/healthonnet/hon-lucene-synonyms. It worked like a charm. This is really a amazing solution for query-time synonym expansion. I have integrated this plugin with solr 4.2.1 and its works great. Are there any scaling issues with the synonym feature.That is, can it handle thousands of entries in the example_synonym_file.txt . for instance in my use case there are 63k entries .How this will effect the Solr performance. Hi Nolan, first thank you for the great plugin! We are testing it for our KM system and so far it’s working perfectly. This should return true if both happy and opera are found in the KCTITLE field and false otherwise. Unexpectedly it returns false, even though KCTITLE contains ‘joyful’ and ‘opera’ and joyful=happy. I know for sure the query is correct because when v=’KCTITLE:(joyful opera)’ KCTITLE_FULL returns true -> which means it’s not an issue with the synonym_edismax and the q.op parameter. Never mind, found I was missing the qf parameter. Working ok now, thanks! Thank you very much for your great plugin. I am currently using it in our solr-based search engine for synonym handling, and it works like a charm! Just one question here, I found that for query has multiple terms, the expanded synonyms will always contain the original query, even if I specified the explicit mapping (“=>”) in the synonym.txt file. Is there a way I can get rid of the original query? I know this blog post is a bit outdated, but still.. quite an amazing and detailed explanation. Greatly appreciated!! My self Lalit Joshi. I am having a problem with solr synonym search. My synonym search is working fine until the phrase length is 11 characters including spaces. So If I create synonym for the word “Marketing Technology” like “Marketing Technology,mark,martech” it won’t work until I reduce the size of the word “Marketing Techonology” upto 11 characters For ex: “Marketing t,mark, martech” is working for me. So just want your help whether or not there is some phrase size limit for synonym searching. Also, I have added synonym filter only in the and not in the index time. Thank you. Took my synonym filter out of query analyzer and everything started working a little more in alignment with my expectations. Hello, What would be your updated strategy for SOLR 7 and on?